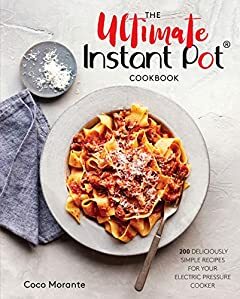 The well-tested,Â fully authorizedÂ recipes in The Ultimate Instant Pot Cookbook cover a range of flavors and occasions, making this the ultimate collection of recipes for the home cook who values the convenience of an electric pressure cooker. This is the only book you'll need when looking for tried-and-true classics like creamy tomato soup, ground beef stroganoff, chicken mushroom casserole, or peach cobbler; international favorites like carnitas, chicken tikka masala, or refried beans; and crave-worthy treats like French toast casserole and triple chocolate cheesecake. There are even easy entertaining recipes, like artichoke-spinach dip, and special occasion recipes such as the classic Thanksgiving favorites of mashed potatoes, creamed corn, and more. With special sections of vegetarian recipes and jams, jellies, and pickles, this collection goes deeper than other Instant Pot books and has something for everyone. And recipes for every meal of the day, from breakfast to dessert, make this book yourÂ one-stop sourceÂ for mouthwatering meals all day long. Printed on high-quality paper and bound in a harcover format filled with beautiful photographs, this is truly the ultimate book for gifting or self-purchase, and destined to become the beloved Instant Pot cookbook.